Eight unknown members of the Toronto Police Service, contravened the Polices Services Act, and Rules and procedures of the Toronto Police Service, Professional Standards, by working in conjunction with reporter Colin Freeze and the Globe and Mail, to arrest Brad Love on March 19, 2009 during a public meeting. This conduct tends to lower the reputation and brings discredit upon the Toronto Police Service, and marks it as a police force more interested in getting their faces in the newspaper then to dispassionately and professionally uphold their duties in violation of the Police Services Act and Rules and procedures of the Toronto Police Service. March 19, 2009, 9:00pm, at the [HOTEL], Toronto, Ontario. 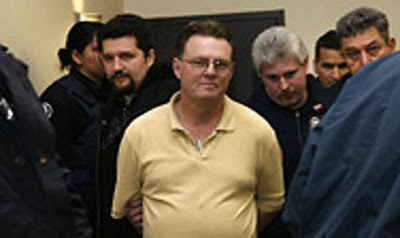 On March 19, 2009 at 9:00pm, 8 unknown members of the Toronto Police Service burst into a public meeting of the Alternative Forum (sponsored by the Canadian Association for Free Expression) to arrest a Mr. Brad Love. The officers coordinated the raid with the Globe and Mail who dispatched, both a reporter and photographer, to publicize the arrest of Mr. Love on an alleged violation of his probation. Prior to bursting into the public meeting, the police coordinated with the Globe and Mail reporter and photographer. 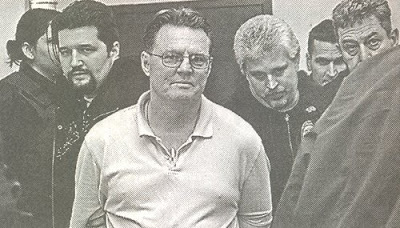 On March 20, 2009, the Globe and Mail ran a story on page A-2 on the arrest, along with a photograph of Mr. Love in handcuffs surrounded by 6 members of the Toronto Police Service. 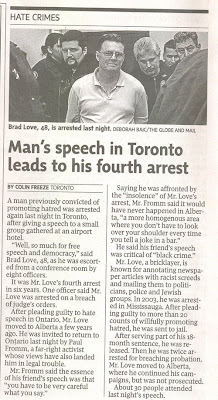 The article was erroneously headlined “Man’s speech in Toronto leads to fourth arrest”. This headline was false, as it was not Mr. Love’s speech but letters he had written in the past few months that led to his arrest. This complaint is on the actions, behavior and coordination with the media. I make no submissions on Mr. Brad Love, his alleged probation violation or any charges against Mr. Love. The courts are seized with that matter. This is a public interest complaint regarding the policy and actions of the eight unknown members of the Toronto Police Service. 1: Members of the Toronto Police Service alerted the Globe and Mail about an upcoming arrest, which the officers wanted to make public. This marginalized and demonized the accused who, is after all, a political dissident charged with sending non-threatening letters..
2: Members of the Toronto Police Service conspired with the Globe and Mail to arrest Mr. Love. 3: Once the coordinated assault on a public meeting had been arranged with the media, members of the Toronto Police Service, acting as a political police force and wanting to publicly embarrass Mr. Love, excessively dispatched 8 officers to arrest a non-violent, unarmed 45-year old, letter writer on an alleged violation of probation. 4: Members of the Toronto Police Service were rude and used excessive force to burst into a public meeting. The 8 officers were overtly aggressive with participants of the public meeting and refused to give their names along with taunting participants of the meeting. Further the officers refused to state what the charges were against Mr. Love, which caused the Globe and Mail to erroneously report that Mr. Love was arrested for a public speech he gave. The headline in the press was “Man’s speech in Toronto leads to fourth arrest”, which is 100% erroneous. Paul Fromm, the meeting chairman, respectfully asked an unknown officer why Mr. Love was being arrested and was ignored and rudely dismissed with: "Are you his lawyer?" 5: Members of the Toronto Police Service acted unprofessional in violation of the Police Services Act and Rules and procedures of the Toronto Police Service, Professional Standards. 6: The actions of the 8 members of the Toronto Police Service have brought the service into disrepute and tends to lower the credibility and reputation of the service. This is especially so considering that Rexdale is an area of high gang activity and the use of eight officers to arrest a middle aged letter writer seems to a reasonable member of the general public to be a woeful waste of manpower and resources. REXDALE. March 19, 2009. Eight burly Metro policemen burst into a Rexdale hotel meeting room this evening and handcuffed and arrested former political prisoner Brad Love, apparently, for "breach of parole." Mr. Love had just finished giving a rousing talk on freedom of speech in Canada to a standing room only gathering of supporters of the Canadian Association for Free Expression. He had warned that police were eager to crack down on immigration critics. Almost prophetically he explained: "If immigration were reformed and criminals kept out, it would mean far fewer cops and less overtime, also fewer social workers. Immigration is a growth industry." Mr. Love was convicted, in 2003, under Sec. 319 of Canada's notorious "anti-hate" law Sec. 319 of the Criminal Code for writing letters to MPs, MPPs, and newspapers -- over 10,000 letters he reckons in a 20 year period. He drew the stiffest sentence ever -- 18 months in prison. Earlier, while violent criminals were released on bail, Mr. Love was repeatedly denied bail. At one point, his parents unsuccessfully offered to post $250,000 and were turned down. Mr. Love was twice sent back to prison, once for 46 days, the second time for 5 months, again for writing non-violent, non-threatening letters to public officials. After his last stint in prison, he was ordered for three years not to write to ANY elected official in Canada. For the past two and a half years, Mr. Love has worked in Fort McMurray in the oil industry. Meeting chairman Paul Fromm, Director of the Canadian Association for Free Expression, called tonight's arrest "an outrage. This is like Haiti. We're becoming a banana republic -- 8 cops to arrest an unarmed man at a political meeting!" Mr. Fromm pointed out that Rexdale has some areas notorious for gunfire and killings between rival Jamaican gangs. "I guess there are no crack dealers to arrest tonight. So, the local constabulary can free up eight men to arrest a letter writer who complains about poorly screened immigration and immigrant crime." CAFE organized protests outside the prison when Mr. Love was twice incarcerated for writing letters in apparent violation of his parole conditions. "What sort of country jails political dissidents and letter writers?" he demanded. "It's a disgrace."